Deepika Padukone has all the reasons to feel on top of the world as her much-awaited magnum opus Padmaavat is continuing its dream run at the Box Office. While the actress is busy celebrating the enormous success of Padmaavat, megastar Amitabh Bachchan has given her reasons to cheer further. 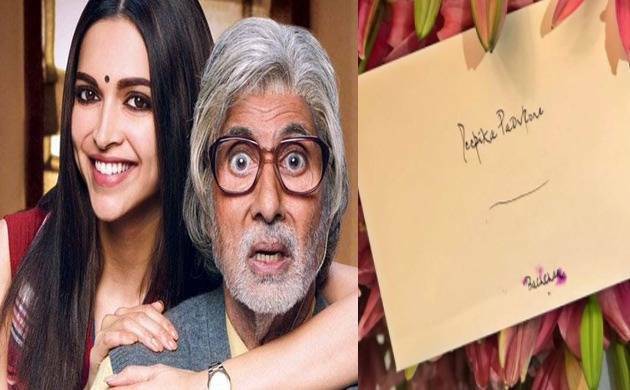 After Ranveer Singh, Big B is now all praises for Deepika 'Padmavati' Padukone and has sent a handwritten note and flowers to the actress. Deepika is being inundated with heartfelt messages from across the country since ever Padmaavat hit the theatres, but it seems like Amitabh's coveted appreciation stands a class apart for the diva. Thanking her reel life 'Baba' Amitabh Bachchan, the Bajirao Mastani star posted an image on Instagram. “there are awards…there are rewards…& then there is THIS!Thank You Baba…🙏," the caption above the picture read. In 2015, senior Bachchan played the father of Deepika Padukone in Shoojit Sircar's Indian comedy drama film Piku. The story of the movie revolves around the short-tempered Piku Banerjee (Deepika), her grumpy, ageing father Bhashkor (Big B) and Rana Chaudhary (Irrfan Khan), who is stuck between the father-daughter duo, as they embark on a journey from Delhi to Kolkata. Earlier, Ranveer Singh on Tuesday also took to photo-blogging site Instagram and shared his excitement and zeal with the world.
" (I got my award) Mujhe mera award mil gaya...😇🙏🏽 @amitabhbachchan," Ranveer wrote. Meanwhile, Amitabh is not the first celeb to praise the mind-boggling performance of the duo. Several Bollywood biggies took to their official Twitter handle to wish them luck. Besides Ranveer-Deepika, Sanjay Leela Bhansali's visual spectacle and Shahid Kapoor's measured performance are also being applauded by audiences and critics. i saw Padmavati by SLB. i am sooooo proud of @sudeepdop .. what a visual spectacle.. i thoroughly enjoyed. @RanveerOfficial @shahidkapoor and of course.. the one and only @deepikapadukone ... thank you for the cinema! Also starring Jim Sarbh and Aditi Rao Haydari, Padmaavat has managed to mint a stupendous amount of Rs 176.50 crore and is expected to cross lifetime biz of Bajirao Mastani anytime soon. Interestingly, Padmaavat marks the third collaboration of Ranveer, Deepika and Bhansali after Goliyon Ki Rasleela Ram-Leela and Bajirao Mastani. On the work front, Deepika will next be seen in Vishal Bhardwaj's 'Sapna Didi’s life-based film'. Also starring Irrfan Khan in lead role, the movie is scheduled to hit screens on Gandhi Jayanti this year.